We had this conversation with a group recently and I was torn on my answer. Peyton Manning, Reba McEntire or Natalie Grant? If you don’t like football, red heads or Christian music you would disagree with any of my answers. We all have different definitions of what makes a person “famous”. Is someone deemed famous because they have a gazillion followers on social media? Does famous mean they have won awards and broken long-standing records? Does famous mean they live in a mansion and travel in limos and private jets? I don’t know the answer to that question because it’s an individual choice. But I do know that when I met Peyton Manning, Reba McEntire and Natalie Grant they were all kind, took time to talk to me and made eye contact. They may not remember me a day later but they made me feel special at the moment we met. There is one person who is famous but not of celebrity status that we all have personal access to after we meet Him for the first time. He is Jesus. He doesn’t fall in the definition of famous as noted above. He doesn’t have a social media account. He didn’t set out to break any records and he sure didn’t live in a mansion and ride around in limousines. But once you meet Him, He never forgets your name. He is always available to talk to you, listen to you and help you night and day. There is no agent involved that you have to go through to gain access. You don’t need a cell phone number or a secret code. Just an open heart and a willingness to surrender. I hope you’ve met the most famous person I have in Jesus and if not, ask Him to be a part of your life today. You may not get celebrity status, but you will have access to the most powerful being in the entire universe and that, my friend, is better than athletes, actresses or millionaires. Who’s the most famous person you have ever met? I hope you can say “Jesus”. This entry was posted in devotional, inspirational, motivational, spiritual on January 31, 2018 by Deanna Young. Deanna here with another edition of Make A Difference Monday. This week I am going to encourage you to make a difference to your spouse or boyfriend or girlfriend (from now on I will refer to them as SIG-OTHS…significant others) 🙂 . If you don’t have a SIG-OTH, then I encourage you to find someone close to you who you sometimes forget to be kind to. It’s easy for us to overlook our SIG-OTH because sometimes, let’s just admit it – we tend to take advantage of them. For example, I know that every day my husband picks up the mail. I drive right by the mailbox every evening but never think to pick up the mail. Why? Because I have come to expect him to pick up the mail. Also on evenings that he gets home before I do which is typically during non-planting or non-harvest months, I know that he is probably going to have dinner ready for me. During planting and harvest months, he knows that I am going to bring dinner to the fields. Sometimes these acts of kindness may get overlooked because we have become accustomed to them just being done for us. Is there something in your life that your SIG-OTH does for you that you have gotten used to and for which you forget to thank them? Take the opportunity this week to show kindness to your husband, wife, boyfriend or girlfriend or someone very close to you to let them know how much you appreciate all they do. Leave a special note on the mirror or in their vehicle for them to find. Send a “thank you for all you do” text. Take them out to dinner or bring home their favorite take-out. Whatever the gesture may be, do something special for your SIG-OTH today. I promise you, that when done in love, it will make a difference to your day as well. Happy Monday and let’s go change the world together……one act of kindness at a time! 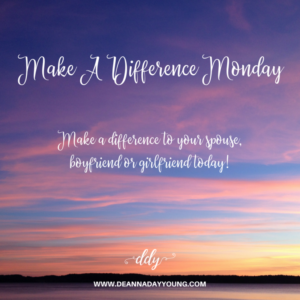 This entry was posted on January 29, 2018 with tags: #kindnessmatters, #makeadifferencemonday, #makeadifferencetosomeoneeveryday by Deanna Young. How Long Is God’s Leash? You’ve seen those retractable leashes people use when walking dogs, right? The leash is attached to the dog’s collar and the dog has freedom to roam until the leash holder pushes the button to stop the tension in the line which in turn halts the dog from moving further away. Our daughter uses one of those when walking her dog in an area that is unfamiliar or filled with people where she is nervous her dog may take off from her sight. He doesn’t like this leash, especially when the tension is retracted and he loses his freedom to roam. We don’t like it either when we are moving further away from the Lord and He puts something in our spirit that says “stop, don’t go there.” We argue and fight and tug and pull wanting to go our own way. But something inside us says “don’t do that”, “don’t go there”, “hold up”. It’s God speaking to us through the Holy Spirit keeping us on track and keeping us close to Him and out of the danger of the devil’s ways. Sometimes though we are so dead set on going our own direction that we keep tugging and pulling and break the leash and do our own thing. Ah hah….free will. But just like the dog, when the fun is over and we get scared, we eventually come running back trying to find our master. If you’re struggling today knowing that you are heading in a direction that you are feeling pulled deep down not to go, stop right now and let the Lord retract you right back to Him. 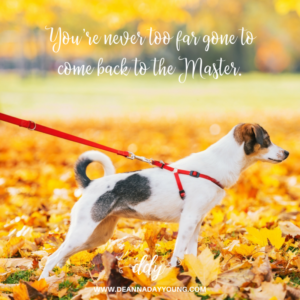 You’re never too far gone to come back to the Master. This entry was posted on January 26, 2018 with tags: #jesusforgives, #jesussaves, #nevertoofargone by Deanna Young. Paint Your Corner Of the World. January. I seem to always feel a little down and somewhat depressed this time of year. It’s cold in Indiana and although I love the snow, once it melts away, the land just looks dirty. Christmas is my favorite time of year and I look forward to the holiday season starting in September celebrating fall and Thanksgiving and then, for me, the best time of the year. Then I prepare my goals for the new year and am excited to start fresh. But I have such a hard time getting back into the swing of things. I procrastinate. I seem to start worrying more. I don’t know…maybe it’s because my mind isn’t as filled with busyness as it is during the holidays. But all I know is that I HAVE to get out of this low, lazy lull that I am in. What seems to help me is to remember it’s not about me. Life. It’s not about me. It’s not about what others can do FOR me but rather what I can do for others. About what I can do for God. How can I make my little corner of the world a little brighter for others? And then it will start looking brighter for me. Life throws us curve balls. Work isn’t always fun. People are not always kind. My ideas aren’t always others’ ideas. God didn’t call me to do what others are called to do and vice versa. So today, I’m going to get back up. Kick myself in the bottom and get busy painting some sunshine in my corner of the world. It’s up to us to show God’s love to others. We are in charge of our joy. It’s not about what HAPPENS to us. We all have bad days. But rather it’s about how we HANDLE what happens to us. David cried out to God in Psalm 94:19 – [God,] when anxiety was great within me, your consolation brought joy to my soul. I’m going to work real hard to find joy in my day, sunshine in my path and spread that joy everywhere I go to overcome the anxiety within me and let Christ bring joy to my soul. Who wants to paint some joy with me today? This entry was posted on January 24, 2018 with tags: #kindnessmatters, #makeadifferenceeveryday, #makeadifferencetosomeoneeveryday, joy by Deanna Young.